The sinister serpent cult of Apep the Devourer has returned! Once hunted to near-extinction to quell their insatiable hunger for living sacrifices to their scaled god, a new power has arisen claiming to be an avatar of the dreaming serpent and has redoubled their rapacious campaign of terror with an inhuman cunning and savagery. Content to lurk in the shadows no longer, the serpent cult must be stopped before it spreads once more across the Pharaoh Kingdom and the sands again are stained with blood and venom while their mysterious master laughs. 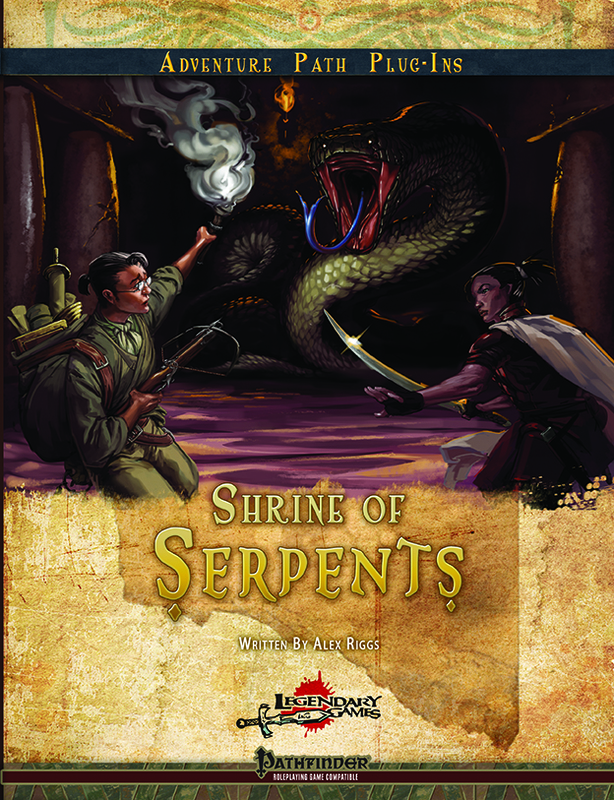 Shrine of Serpents is a 9th-level adventure for the Pathfinder Roleplaying Game that can be played on its own or as a complement to the third or fourth volume (#81-82) of the Egyptian Adventure Path from Paizo, Inc. The Legendary Games tradition is to combine rich story and background, innovative layout, beautiful aesthetics, and excellence in design that is second to none. Pick up this 20-page adventure today and Make Your Game Legendary!